^ Tsironi M, Andriopoulos P, Xamodraka E, et al. (2004). 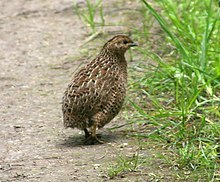 "The patient with rhabdomyolysis: have you considered quail poisoning?". CMAJ. 171 (4): 325–6. doi: 10.1503/cmaj.1031256. PMC 509041. PMID 15313988.